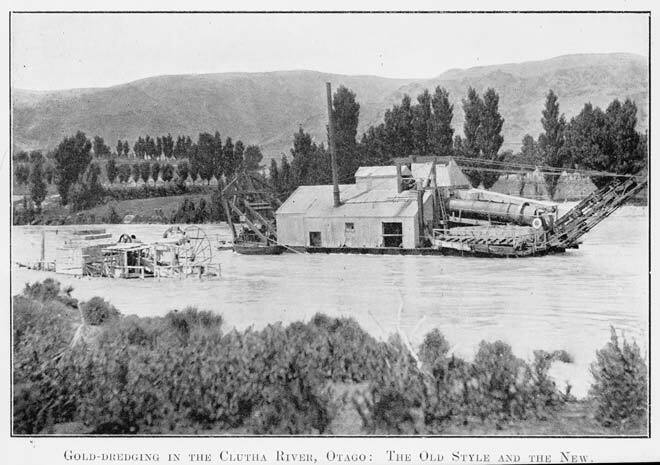 These two dredges on the Clutha River are of different designs. The smaller dredge in the foreground has a current wheel, which powered the chain of buckets that lift gravel from the river bed. Current wheelers were the main dredge design used in Central Otago in the 1870s and 1880s before being supplanted by steam dredges. The bigger dredge was steam powered and could lift more. It could also work in slack water as it did not depend on the river’s current to power it.